Making your cat happy is easier than many people think. 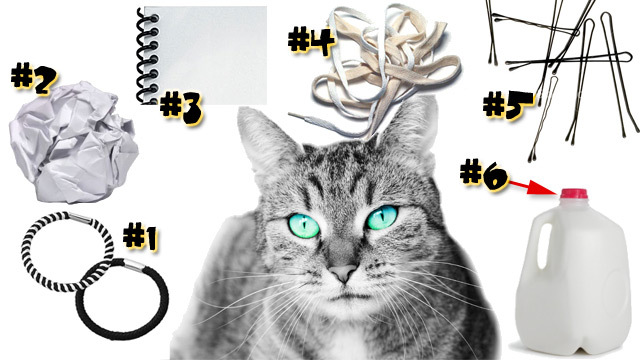 Here are a few simple and cheap cat toys you can use to keep your cat entertained and active. My cats — like many indoor cats — are lazy, sleepy and generally overweight. They have an entire box full of toys that they can get out at any time but they have played with them so much they tend to ignore them. It takes a constant flow of new playthings to keep their interest. Elastic hair bands: These are great for a few reasons. They're super cheap and my wife has a stack of them. Even better, the used ones have her scent on them, making them even more desirable to our cats. Cats love things with strong smells — it's an instinctive thing to mask their own scent. Balled paper: Don't throw out junk mail or old documents straight away — ball them up and throw them. Cats like things to get away from them so they get the thrill of the chase. Try different types of paper as well. Binder paper ripped from a spiral-bound notebook works well because of the small scraps of paper on the edges. Spiral binding: Cats like anything with an unusual texture. Remove the spiral binding from an old notebook and cut it into small pieces — ideal for spring-like toys that are flexible and roll on hard flooring. Shoe laces: Shoe laces are a cat favourite mostly because they get stuck to their claws, and you as the owner can get in on the action by dragging them across the floor or dangling them. Just rip out an old pair from your shoes and you have a great toy that has outdoor scents built right in. Bobby pins: Again, my wife has a ready-made supply of these and you can get more for very little money. Slightly spreading them into the shape of a V adds a little more dimension. Got any other cheap toys that work for your cat(s)? Let us know in the comments. Plastic Lids off Water Bottles (small clear ones) My cat goes bananas over them. Our cat goes crazy for balls of aluminium foil. As soon as she hears the distinctive sound, she comes running. You use lifehacker for as a source of mainstream news? Are.. are you sure you understand how this website works? Thanks for the hot tip John! I have just updated my lifehacker link to point to news.com.au. No wonder I had no idea that Deng Chao-Ping died. Bored enough to make that asinine comment, much? Kitchen foil balls are our cats' favourite too - even just scrunching them up. Hanging an old bedsheet to create something they can hide behind and ambush out of goes down well, as does a maze from cardboard boxes with doorways cut between them. My cats love playing with the cardboard ring from a used sticky tape roll and they go nuts over ping-pong balls. yep, ping-pong balls drive out cats nuts also.. but poor fella keeps loosing them..
Our cat chases light and reflections. Torches and laser beams work great, as cruel as it may sound. Nice to hear other cats like alfoil balls! Ours goes nuts too. Will even bring the ball to us sometimes. Empty boxes also cheap & highly recommended. Hey Michael - Slow life much? You trolled a thread about cats toys! Zing of the day! Thanks for your applause everyone. My cat goes nuts for twist ties. Put a loop in one, toss it on the floor, and he's good to go for at least an hour. Bottle tops from beer bottles are great as well. He'll bat one around on the granite floor long after I've gotten sick of the noise. I came in here JUST to write twist-ties! I thought I was the only one to stumble on this holy grail of cat happiness. Seriously, I think our cat would kill us and sell our bodies for twist ties. Behaves in such a happy, energetic way with them that she does with nothing else. Try it, people. Do not buy toys, the cat won't like 'em. For the sake of owner sanity, also invest in some draught excluders that can stop all these wonderful playthings going under fridges, couches, etc etc. Ooh, +1, what a good idea! Hadn't thought of that. For twist ties, try a pick-up tool from the hardware store. It's a magnet on the end of an extendable rod (about the diameter of the old rabbit ear antennae.) Mine has a light on it to help me find the non-magnetic elusive get-aways. And there always seems to be something. My biggest probems are under the stove. Come to think of it, you might be able to use one of those counter space savers for under the refrigerator and stove. You know, those long plastic things that stick to the stove (via magnet) and fill the gap between stove and counter top. Oh, yeah, cat toys.... one of my cats loved pop poms. You can buy them very cheaply at craft stores or you can make your own with a pop pom maker. My elderly cat goes totally kitten mode with christams decorations, and even the tree. In december it gets hard to sleep, because he will climb the tree, knock the baubles off, and whack them round the wooden floors like a pro hockey player! He bought the tree down twice last year too.